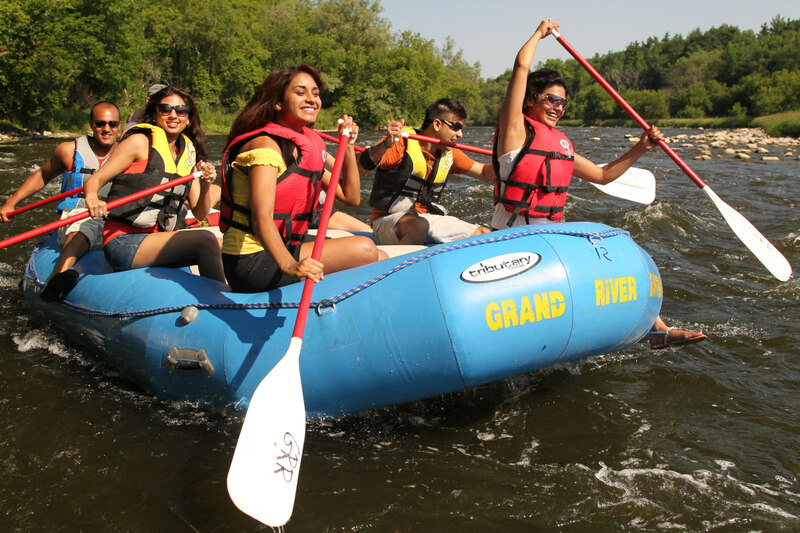 The Grand River Rafting Company offers two different rafting routes to explore on the Grand River. Customers can choose from two types of rafts… 8 person or 12 person. Our rafts are a high quality, self-bailing rafts… that will not tip over. Our rafting trips range from 11 kms to 13 kms. Our rafting routes are in a wilderness setting… with good wildlife viewing. The beauty of the valley is nature unexpected. The Paris to Brant Park is 13 kms… good for all skill levels Learn More. With rafting… you can go on your own with a map… or hire an interpretive guide to steer the raft down the river. To add one guide is $150 plus HST. The cost is $150 per 8 person raft or $200 per 12 person raft plus $10 per person plus HST. To add a guide is $150 plus HST per raft. Price includes boat, life jackets, paddles, bailer kits, dry bag and your shuttle ride. With us, your safety is more important then your money. If water temperatures are below 10 C, we will not put you at risk with hypothermia.